Maybe you have not thought of this before, but the stickers attached to the fruits and vegetables are not only there to help the cashier scan the price. The PLU code, or the price lookup number on the sticker also stands for the way of production, meaning by reading this code you will know if the product is genetically modified, organic or produced with chemical fertilizers, fungicides or herbicides. 1. If you can see only four numbers in the PLU, then the product was grown conventionally or “traditionally”, and pesticides were used during the cultivation process. The last four letters of the code represent the kind of the fruit or vegetable you are buying. For example, bananas are always labeled with the code of 4011. 2. If there are five numbers, and the first is “8”, then the product is genetically modified. Genetically modified foods trump being organic, and you can not eat organic fruit or vegetable grown from genetically modified seeds. The label on genetically modified banana (GE-genetically engineered of GMO) would contain the numbers 84011. 3. 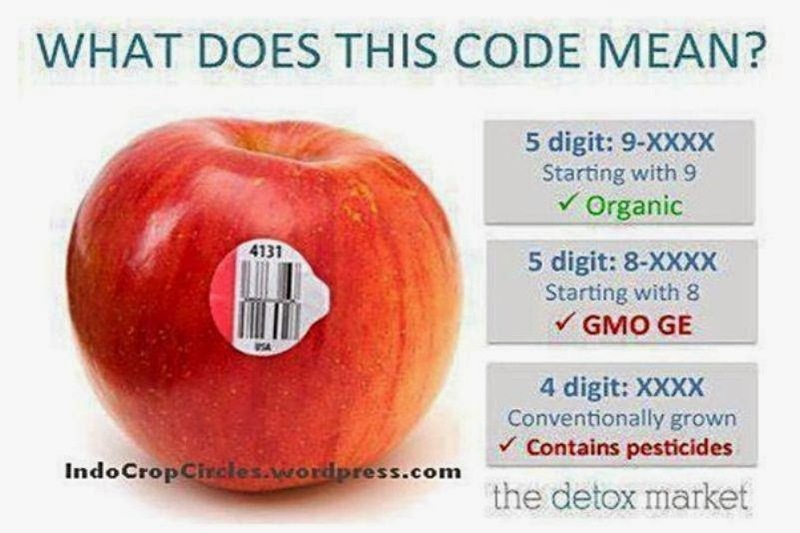 If the PLU code contains 5 numbers, and the first is “9”, the product you are buying is organic. Organic bananas are labeled with 94011. The material used to attach the labels is considered food-grade, but the sticker itself is not edible. Read the full list from the Environmental Working Groups of fruits and vegetables with the amount of pesticides each of the products contains. This list will help you choose organic products, which are listed at the bottom of the list.